Display Cards for Alexa allow products to render “Now Playing” information for music, as well as static display cards for general knowledge questions, weather, to-do and shopping lists, calendar updates, and Alexa skills. If your product has a display, you can enable the Display Cards capability in the Alexa Developer Console to begin receiving directives with visual metadata. For example, after you've enabled Display Cards for your product, when a user asks, "Alexa, what is the weather? 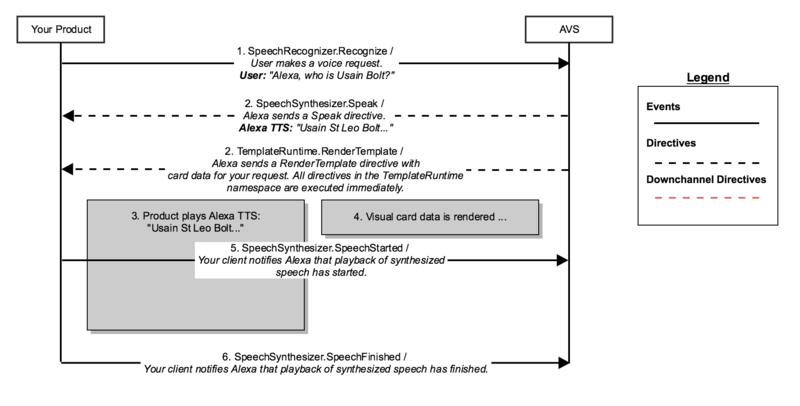 ", in addition to receiving a Speak directive with Alexa TTS, you will receive a RenderTemplate directive with visual metadata that maps to design templates provided by Amazon. To enable display cards, you must declare the TemplateRuntime version 1.0 interface in your call to the Capabilities API. For additional details, see Capabilities API. The RenderPlayerInfo directive instructs your client to display visual metadata associated with user requests for audio playback (music). In addition to sending Play directive, AVS will send a RenderPlayerInfo directive with visual metadata specific to an audio content provider that your client will bind to a template and render for the end user. The RenderTemplate directive instructs your client to display visual metadata associated with a user’s request for a for static display cards. For example, when a user asks “Alexa, what's the weather in San Francisco?”. In addition to sending a Speak directive, AVS will send a RenderTemplate directive with visual metadata that your client will bind to a template and render for the end user. The TemplateRuntime interface supports five templates, one for "Now Playing" and four static display cards. The visual metadata provided in each directive will map to a specific component in each display card template. "Now Playing" visual metadata is always delivered as a RenderPlayerInfo directive and maps to the "Now Playing" template for music. BodyTemplate1 A text only template that supports title, subtitle, text, and skill icons. 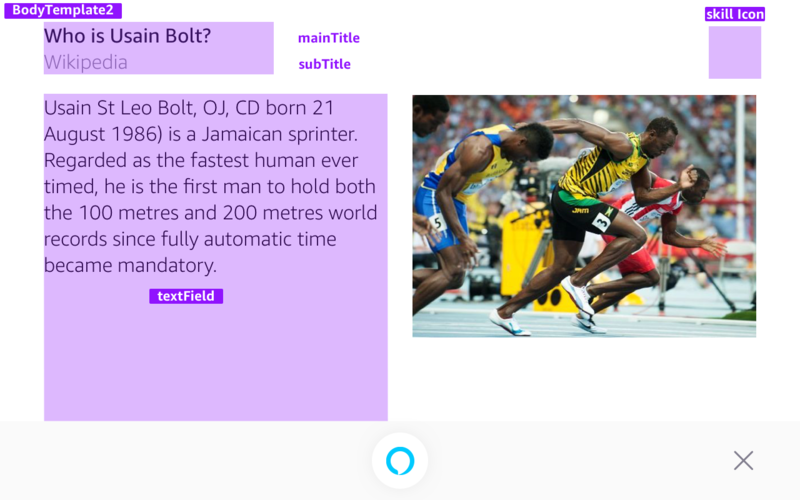 Wikipedia entries without images, and simple cards provided by Alexa Skills. ListTemplate1 A template for lists and calendar entries. Shopping lists, to do lists, and calendar entries. Let's return to our example. 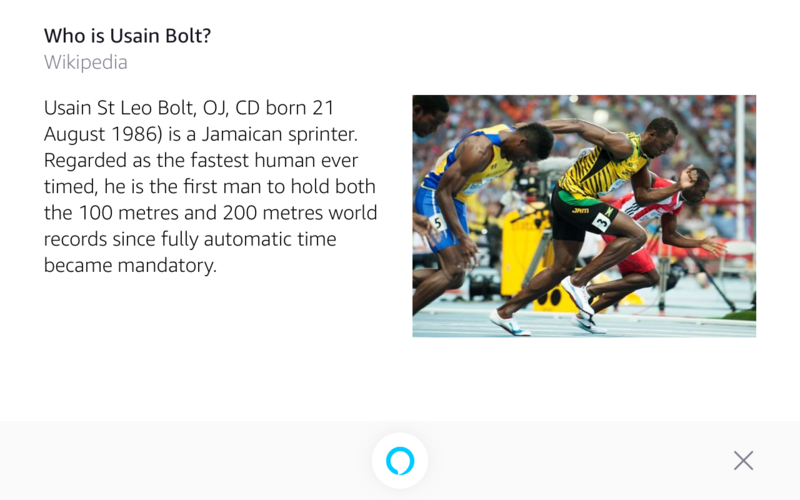 You'll remember that after asking Alexa, "Who is Usain Bolt? ", a RenderTemplate directive was returned instructing your client to display visual metadata for the user. The directive's payload supplies important information like mainTitle, subTitle, skillIcon, textField, and image, which map directly to specific components in the display card template. In this section we're going to dissect that RenderTemplate directive. "textField": "Usain St Leo Bolt, OJ, CD born 21 August 1986..."
Play directives and associated RenderPlayerInfo directives must be in sync. Unlike RenderTemplate, the directive should not always be rendered immediately, but should match the sequence of Play directives. For example, after sending PlaybackNearlyFinished, if you receive a new Play directive and RenderPlayerInfo directive they must be added to the queue and handled when the currently playing track has finished. This means that your display card implementation must be aware of playback state, such as playing, stopped or paused. When implementing display cards, you need to determine how best to render visual metadata for your user. The AVS UX Design Guidelines for Display Cards provide screen specific guidance for TVs, tablets, and low resolution screens, with requirements for binding metadata, and recommendations for display card transitions, interruption behaviors, and the presentation of Alexa states. Click here to view the AVS UX Design Overview for Display Cards. Test display cards with the AVS Device SDK. Review the directives available via the TemplateRuntime Interface. Make sure your product meets the functional requirements for display cards provided in our Functional Requirements for AVS.